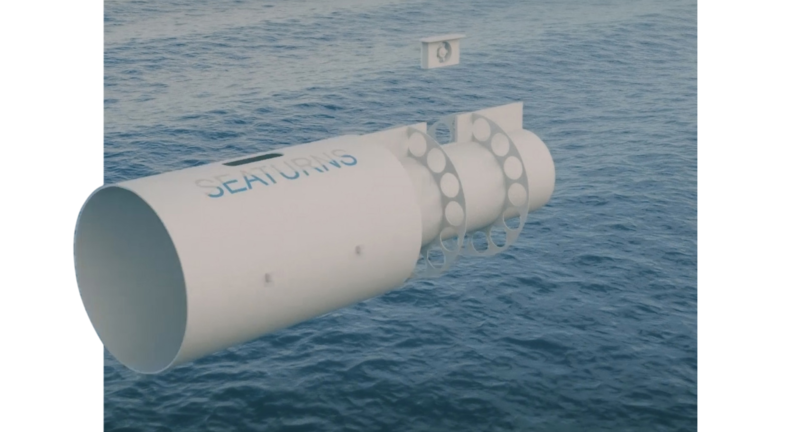 The SEATURNS solution is the result of a study of existing WEC (wave energy converter) technologies with the various obstacles that prevent their commercial development. This study resulted in five research objectives: resisting different sea conditions, efficiently converting energy, according to all different types of swell, minimizing and facilitating maintenance operations, ease of setting up, offering different possibilities of use in different market segments. 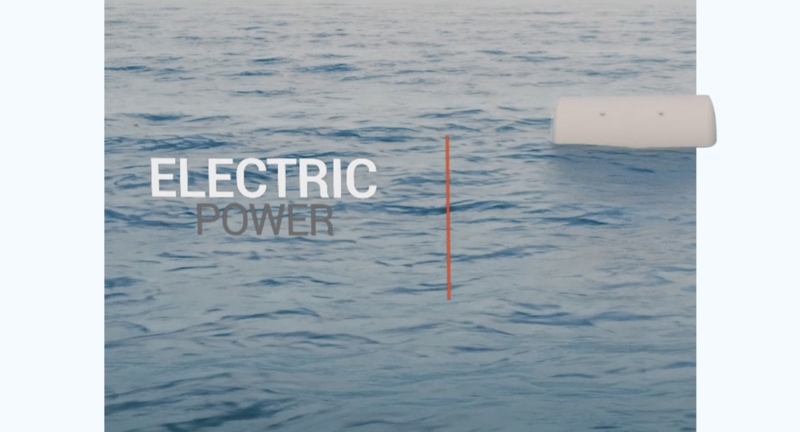 With a global deposit of 18 500 TWH/yr, WEC have a more regularly strong development potential than other RME (renewable marine energy) systems. The free water ballast technique will gauge / low pressure in alternatively two volumes connected by a turbine system set in motion by the generated air flow. Several outlets exist, the provision of point-source electricity in isolated or insular coastal areas or the generation of electricity in networks. Three-quarters of the planet is covered with sea water, an inexhaustible but salty source, and freshwater needs for irrigation, industry and drinking water are constantly growing. The free water ballast technique producing pressure variation is very effective in pressuring sea water and provokes the reverse osmosis principle. 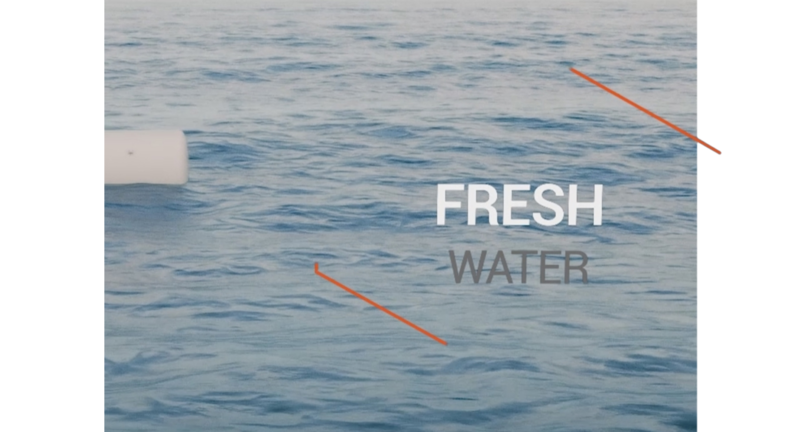 There are several outlets, the production of point fresh water in isolated or insular coastal areas or the mass decarbonate production of fresh water. 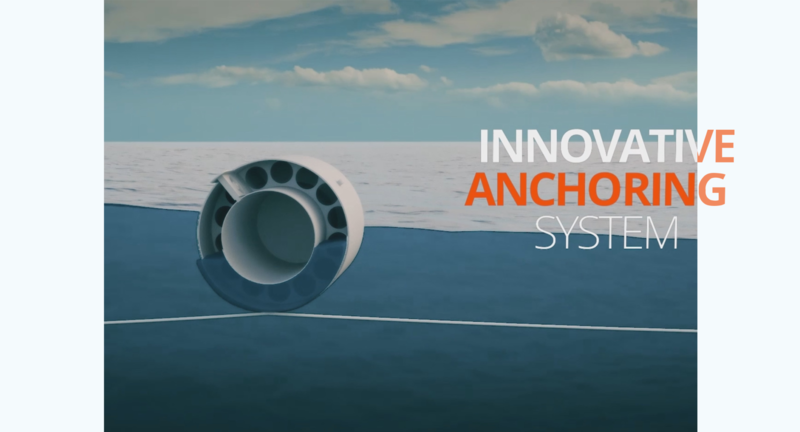 The anchorage system, in particular the peripheral fastening of the mooring line to the float bodies, allows it to associate the pitch movement with a pitch motion that oscillates the free water ballast. 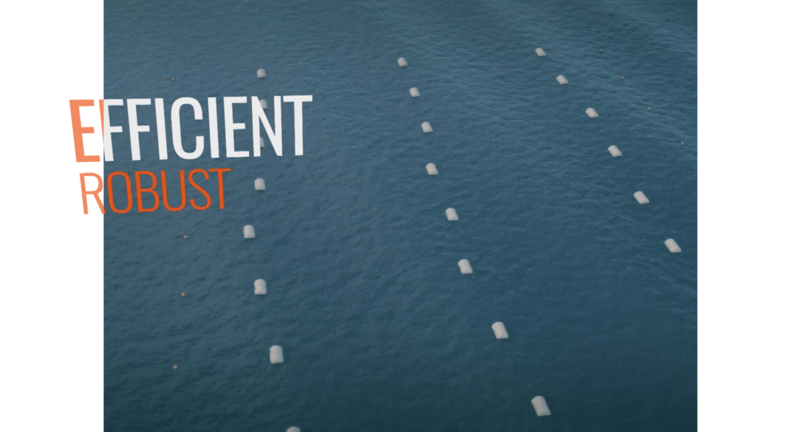 This system allows the ballast to produce on different types of swell even on the longest surges. 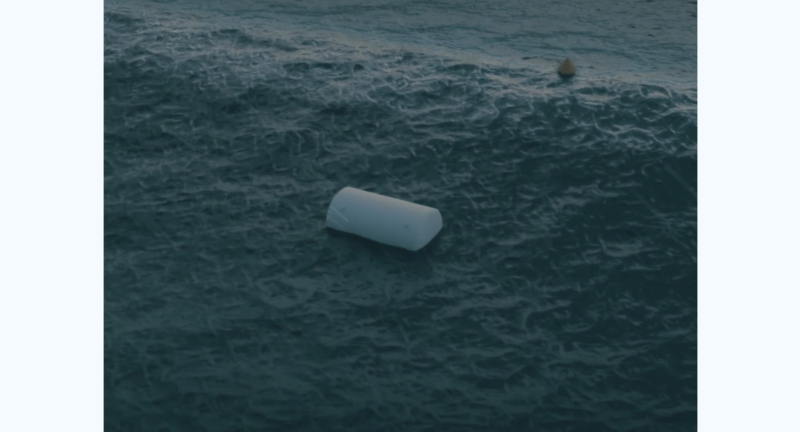 The steel float consists of two coaxial cylinders, of rigid bulkheads and a separate bulkhead, all soldered to each other, the only moving element being the free water ballast, consisting of sea water collected on the spot, (80% of the mass of the float). To produce electricity, the extraction module (PTO) is an air turbine coupled to an alternator. To produce fresh water, the extraction module (PTO) is a pressure converter, which pressurizes sea water to reach the reverse osmosis plant. In both cases, the module is compact and can be extracted simply and easily for control or maintenance. This WEC device does not contain any “problem-solving” devices affecting the longevity of WEC. No hinges, in contact with sea water, with oscillating arms and cylinders. No end stops, impossible to size to withstand tens of millions of swell cycles. No large forces and small velocities. No superstructures sets to extract energy from long waves. The WEC has the shape of a marine beacon, known for its resistance to difficult conditions and longevity. This shape is also the one of tanks containing gases or liquids with low or high pressure. 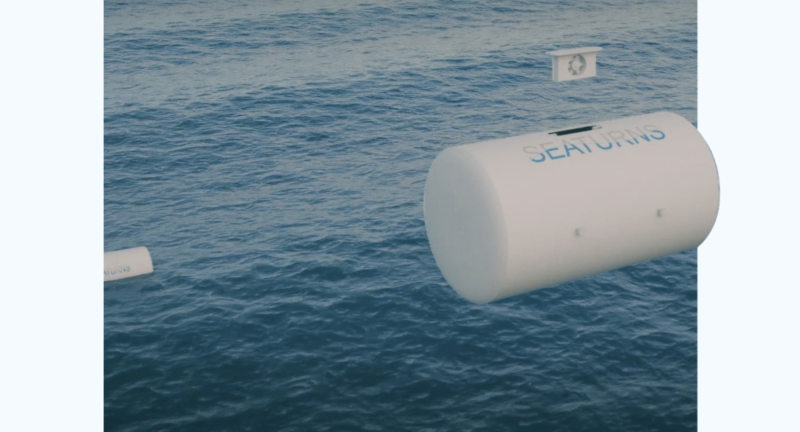 The Seaturns device may operate individually for the supply of electricity or the supply of fresh water, occasionally in isolated or insular coastal zones or can used in groups in production areas by sharing the lines Anchors in an optimum way. 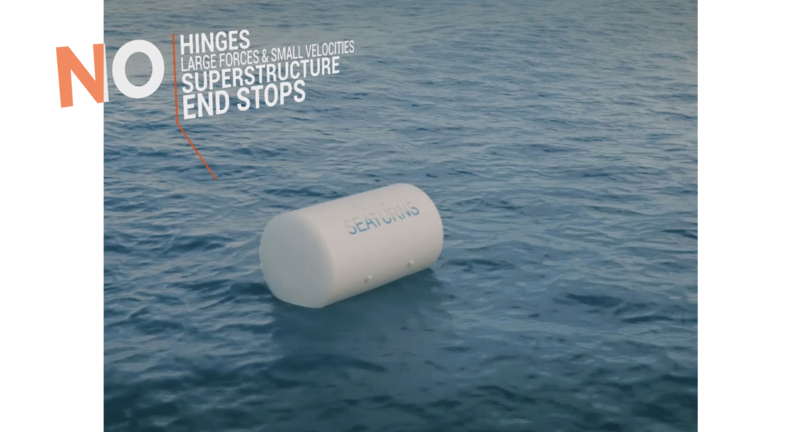 This small size allows profitability comparable to large WEC, is easier and more flexible to carry ashore and at sea, to set up. The tests at the central LHEEA Nantes waves tank tests have shown that the concept is capable of absorbing much of the waves forward energy and converting it into pneumatic power. Even in simple proof-of-concept phase a “capture width ratio” of more than 20% could be observed, an easily improved value by optimization studies.